Hammered Silver Forest Trees - Tabletop Christmas Trees. 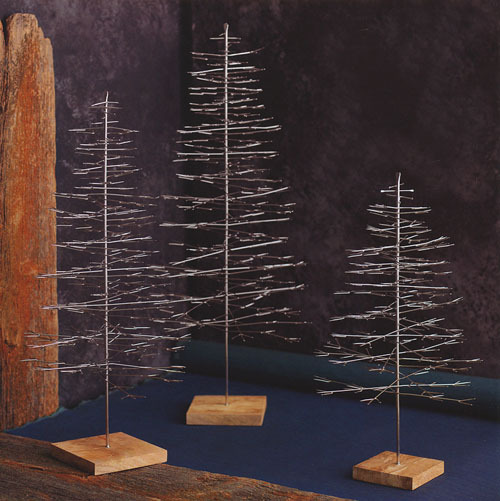 Celebrate the most joyous season of the year with our beautiful Hammered Silver Forest Trees. Our festive silver tabletop trees are fashioned from silver plated hammered brass. The hammered tips of the branches capture the light and add an element of complexity to an otherwise clean design inspired by Scandinavia. These beautiful forest trees offer an exceptionally beautiful backdrop for displaying ornaments to full effect. Decidedly festive, the trees lend a light and airy note to any holiday display. The Hammered Silver Forest Trees are perfect for displaying your favorite ornaments. For a matching look, check our Alabaster Owl Ornaments (sold separately) or our Hammered Silver Forest Tree Ornaments (sold separately). Price is for 1 (one) tree, ornaments are not included. Tree is available in 3 sizes to suit any display space be it the table top, mantle or the corner of a living room. Material: silver plated wire with hammered tips, wooden base.